Viewed with the naked eye, Saturn appears as a bright star in the constellation Ophiuchus, halfway between Sagittarius and Scorpius. Bright Mars is to Saturn's right in Libra. This Friday, June 3, Saturn reaches opposition to the sun. Directly opposite the sun in our sky, the ringed planet rises as the sun sets and sets as the sun rises, remaining visible all night. Saturn is the farthest of the planets readily visible to the naked eye. Currently, the planet is magnitude 0 in brightness (where lower magnitudes are brighter), which is brighter than all but a handful of stars (generally magnitude 1 and higher), but fainter than most of the planets at their brightest (which can reach negative magnitudes). Saturn is best seen when it is at its highest, at around midnight local time, 1 a.m. daylight saving time. 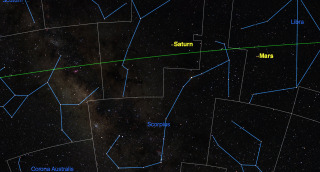 At that time, observers in the Northern Hemisphere can see the planet due south. Saturn is most famous for the set of bright rings around its equator. Unfortunately, these aren't visible to the naked eye, nor when viewing with binoculars. You need a telescope magnifying at least 25 times to see that Saturn is oval-shaped rather than circular, and a magnification of at least 100 times to see the rings in detail. There are three main rings concentric with each other and the planet. There is a moderately bright outer ring, and a much brighter center ring. The third, innermost ring, called the crepe ring, is much harder to see, appearing as a dusky shading within the central ring. It is most visible where it passes in front of the planet's disk. In a telescope, you can see Saturn's rings and at least a couple of its 62 moons. At present, skywatchers can see the northern side of the rings, because the north pole of Saturn is tilted toward Earth. Currently, Saturn is at a point in its orbit where the rings are tilted close to the maximum toward Earth, making for a fine view. Unlike Jupiter's four large moons and many small ones, Saturn's moons are more varied in size. As a result, the number of moons that you are liable to see depends a lot on the aperture of your telescope. Titan is by far the largest of Saturn's moons, and is the only moon in the solar system with a dense atmosphere. At 3,199 miles (5,149 kilometers) in diameter, Titan is second in size only to Jupiter's moon Ganymede, and much larger than either Earth's moon or the planet Mercury. In 2005, the robotic Cassini spacecraft landed the Huygens probe on the surface of Titan, marking the furthest landing from the sun by any spacecraft. Titan is visible in virtually any size telescope, and half a dozen smaller moons are visible in typical amateur telescopes with around an 8-inch aperture (200 millimeters). Saturn's second-largest moon, Rhea, can be seen with a 3-inch (75mm) telescope. Most of the bright moons revolve around Saturn in orbits in the same plane as the planet's rings, with the exception of Iapetus, whose orbit is tilted out of that plane. Unlike Jupiter's moons, which are usually seen in a straight line through Jupiter's equator, Saturn's moons can appear at any angle out from the planet. The best way to identify Saturn's moons is to use a program like Starry Night or SkySafari to print a chart of them. Be sure to choose the orientation that matches your telescope's view. The moons move quite rapidly, so you will need to print a new chart each night you observe. At present, Saturn appears close to the Milky Way, so you can easily confuse the planet's moons with background stars. I haven't said much about the planet itself. Being far from the sun, Saturn's atmosphere is relatively quiet compared to that of turbulent Jupiter. Fine bands of light and dark are visible with larger telescopes, and Saturn's polar region often appears olive green. Occasionally observers have spied bright spots in Saturn's clouds, and have used these to calculate the planet's rotation period, which is about 11.8 hours. This article was provided to Space.com by Simulation Curriculum, the leader in space science curriculum solutions and the makers of Starry Night and SkySafari. Follow Starry Night on Twitter @StarryNightEdu. Follow us @Spacedotcom, Facebook and Google+. Original article on Space.com .